Figure 2-6. Schematic of NASBA reaction.Two primers are used: P1 (antisense) and P2 (sense). The P1 overhang is a promoter sequence for T7 RNA polymerase. A molecular beacon (with fluorophore and quencher, by definition) serving as probe with reporter molecules coupled to NASBA generates a real-time detection system. enzymes, avian myeloblastosis virus reverse transcriptase (AMV-RT), RNase H, and T7 RNA polymerase.59 A primer with a T7 RNA polymerase recognition sequence at its 5' end is used by AMV-RT to transcribe cDNA from the RNA template. The RNA template is destroyed by RNase H. AMV-RT then uses the second primer to synthesize dsDNA. The T7 RNA polymerase uses the dsDNA to synthesize multiple antisense RNA transcripts, and the cycle is repeated. Generally, amplification is approximately 1012fold in 1 to 2 hours. In NASBA, nucleic acids serve as amplification templates only if they are single stranded and contain primer-binding regions. NASBA is performed isothermally at 41°C, so RNA is preferentially amplified, because at this temperature genomic DNA remains double stranded and does not bind primers. It is therefore possible to detect RNA in a genomic DNA background without getting false-positive results. 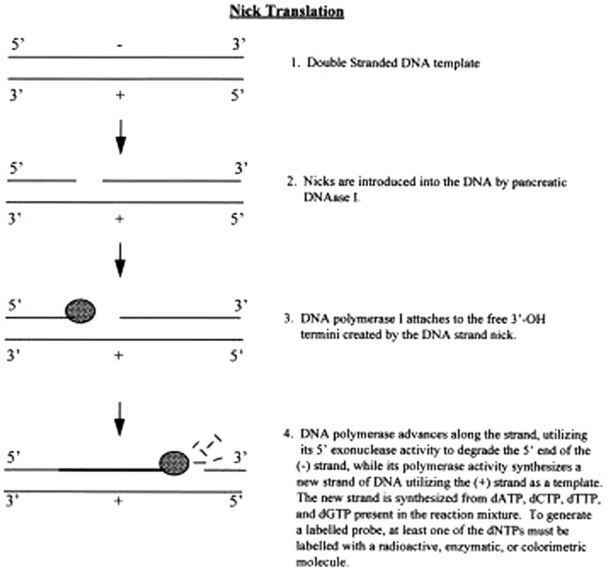 Specific DNA amplification using NASBA may be done by introducing a denaturation step before amplification. Quantitative detection of target nucleic acids is achieved by use of an internal calibrator added at RNA isolation. The calibrator is included at a known concentration, is coamplified during the NASBA process, and is subsequently identified along with the target RNA. Quantitation is based on the analysis of signals generated in real time (one color for calibrator and another for target).